The M-Audio BX5-D3 5 Inch Powered Studio Monitor delivers faithful recreation of your signal thanks to its amazing acoustic and dynamic control. You can mix with the confidence of knowing your final result will be accurate and ready for any listening environment. Negate any problematic bass frequencies and limit the impact of nuisance standing waves thanks to BX5-D3’s special Acoustic Space control for precise adjustment of BX5-D3’s sound output in line with your studio space. The BX5-D3 Carbon studio monitor has a frame constructed from vinyl-laminated, high-acoustic-efficiency MDF meaning that there is zero unwanted resonance from the unit itself and no energy is wasted upon conversion of sound directed to the drivers. Built into this solid cabinet, you get a magnetically shielded, 5" Kevlar curved cone low-frequency driver with the high-temperature voice coil and dampened rubber surround and a 1" magnetically shielded, natural silk dome for all your high-frequency needs. Working together with impressive efficiency these drivers are capable of producing a beautifully flat frequency response covering 52 Hz all the way up to 35kHz. The M-Audio BX5-D3 Carbon monitor uses a bi-amplified 100 Watt class A/B amplification system that delivers high power with less noise and ensures that you have all the power you need to handle today's modern music with ease, and plenty of headroom. 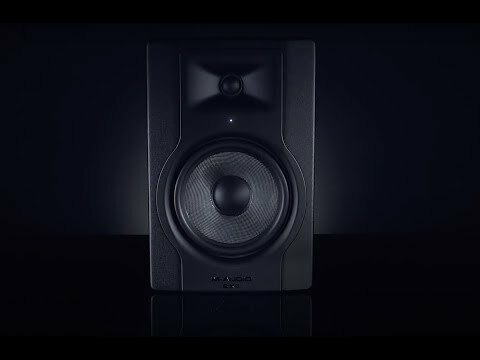 The M-Audio BX5-D3 single studio monitor offers two connection options, specifically, a balanced XLR and a TRS combo input for balanced and unbalanced input. Whatever your application, the BX5-D3 will adapt. A fantastic all-around studio monitor that is compact enough to be placed wherever required, the M-Audio BX5-D3 may look small but will impress on power and beautifully natural sound.